Christmas is well and truly on its way with Christmas parties happening left, right and centre! Lately I have been making a lot of mince pies and whilst I like them I have to admit I am more of a savoury person, so last weekend I decided to try out a new recipe more in line with an open topped pork pie. I have to give credit to Cockburns of Bedale who are the real inspiration for this recipe – for many years when I visited my eldest brother up in Yorkshire we would go to this butchers early on a Saturday morning to buy their open topped pork pies still warm from the oven for lunch (that is if they lasted that long…). If you are ever on the on the A1 heading through Yorkshire, I highly recommend that you make a little detour via Bedale and visit this butchers to try one of their pies, I promise you will not regret it! Whilst the pies have similarities to a pork pie they are not made using hot water crust pastry. Instead this pie recipe uses a shortcrust pastry made with beef suet, the pastry case is then filled with spiced pork meat and topped with homemade cranberry sauce – delicious savoury sweet goodness! The pies make great canapes at a drinks party as they are surprisingly light but absolutely moreish. The recipe below does have a lot of steps, however if time is not on your side and you need a quicker option, then simply follow the cheat options below. Replace the pork mixture with some festive flavoured sausages instead and simply remove the meat from the skins. Use shop bought cranberry sauce preferably containing whole berries. This entry was posted in baking, canape, christmas, pastry, pie, pork, recipes, starter and tagged canape, christmas, festivefood, food, foodie, foodphotography, foodstagram, foodstyling, homemade, pie, seasonalfood on December 16, 2016 by Antonia Cooks. I was chatting to my housemate about making pastry the other day and she was telling me of a Hawksmoor pie recipe that used both eggs and suet in the recipe and it dawned on me that this would be a great way to make sweet shortcrust. By making the pastry with suet it made the pastry beautifully light and more flaky than crumbly. The concept of using two types of fat to make the pastry is not a new one, growing up the Delia Smith recipe that I used to follow for mince pies used equal amounts of butter and to make the recipe. However I have found the in using suet you get a far better distribution of fat throughout the pastry which gives it a marbled look when rolled out and it helps to turn the pies a beautiful golden brown colour during cooking. Now to the mincemeat aspect of this pie – there is absolutely nothing wrong with using shop bought mincemeat! This is exactly what I do however I like to ‘pimp’ it up a bit by adding chopped walnuts, cranberries, glace cherries, plump sultanas and brandy. So if you have some dried fruit or nuts in you cupboard that you would work chuck it in, not only will it add to the flavour it will add to the texture of your pies. Enjoy! This entry was posted in baking, cake, christmas, fruit, nuts, pastry, recipes, tea time and tagged baking, christmas, eats, festivefood, foodphotography, foodstagram, foodstyling, instayum, pastry, recipes on December 9, 2016 by Antonia Cooks. If you like cheese, but haven’t tried Reblochon before I implore you to try this Tartiflette recipe. However be warned this little number is not for the faint-hearted. It incredibly rich and will require you to have worked up an appetite, or to have a lazy afternoon ahead of you so that you may quietly slip into what I like to consider a ‘food coma’ (an afternoon of dozing in front of a fire). Reblochon is an unpasteurised mountain cheese that comes from the Haute-Savoie in France – it has a soft rind that you can eat and a gooey middle. It has quite a strong smell so if you aren’t cooking with it straight away I would keep it in a Tupperware box in the fridge. That being said its taste is surprisingly delicate and nutty which matched with the waxy buttery potatoes and the saltiness of the lardons is absolutely scrummy. Definitely one to try this winter – Bon Appétit! This entry was posted in cheese, christmas, main meal, pork, recipes and tagged cheese, christmas, foodie, foodphotography, foodstagram, homecooking, instayum, recipes, skiing, tartiflette on December 2, 2016 by Antonia Cooks. What a weekend it has been! We (my brothers, their other halves and I) have just celebrated Christmas up in Yorkshire as we are all heading in different directions this year. Over the last couple of weeks there has been a lot of discussion over what we are going to eat. I mentioned to my brothers that I fancied trying to recreate a meal I had recently had at a school friend’s wedding breakfast (pheasant with a Moroccan stuffing). The fact I had never deboned a chicken let alone a Guinea fowl before. How much meat there would be left on the carcass? How long this meal would take to prepare as they wanted to eat at some point over the weekend. How many birds was I intending to do and was I sure that there would be enough to eat!? I tried to quash their concerns by telling them that I had done a lot of research, watched a lot of YouTube videos and felt confident that I knew what to do. In relation to timings, well we weren’t going to eat until the evening so even if deboning the Guinea fowl took an hour each we would still be able to eat around 7.30/8pm. And finally yes there would be enough to eat (I had ordered two Guinea fowl and just shy of 1kg of pork stuffing meat) I felt underfeeding was not going to be an issue. I am pleased to report that in the end the meal was not only a success but that we had leftovers! It may have taken me roughly 45 minutes to debone each bird but it was worth it. I couldn’t have been happier with you the meal turned and even better today we were able to enjoy some pretty yummy sandwiches for lunch before we all headed home. The Moroccan flavoured stuffing with the dried fruits kept the guinea fowl meat wonderfully moist. The spices were subtle and did not overpower the Guinea fowl. The dried fruits added just enough sweetness and gave the stuffing a slightly tangy flavour and finally the pistachio added a pleasant texture. If you don’t wish to go to the efforts of deboning a Guinea fowl then just make the meat into stuffing balls instead and cook the Guinea fowl (or chicken if you prefer to choose a slightly cheaper meat) and stuffing separately. So the big question, would I make it again? Without a doubt! However, I would stress that this is a meal for special occasions given the time it takes to prepare but it is absolutely worth the effort! Good luck and enjoy! 1. Place the onions in a sauté pan with a little oil, cover with a lid and sweat on a low heat until soft. (Do not rush this process as you do not want the onions to catch and burn). 2. Place the apricots, cranberries, pistachios, breadcrumbs and spices in a large glass bowl and mix together thoroughly. 3. Once the onions are soft and have cooled slightly add to the mix with the pork meat. Use your hands mix together all of the ingredients making sure that the fruit is evenly distributed throughout the stuffing. Cover with cling film and place in the fridge whilst you prepare the Guinea fowl. Make sure your boning knife is very sharp and if necessary sharpen your knife before starting. Make sure that you have a clean tea towel to hand before starting. Start by removing the Parsons nose. Remove the wishbone, being careful not to snap it off. If you do snap it off by mistake, you’ll need to remember to remove the splinters of bone at the end. Next move on to the wings, if you imagine the wing to be an arm at the ‘elbow joint’ remove the lower section of the wing so that you are left with just the top section of the wing. Turning to the legs, at the knuckle carefully slice through the skin. Then holding the chicken leg in the tea towel pull the knuckle off – the reason you do it this way is so that you remove some of the sinew. If you are not strong enough don’t worry, just cut the knuckle off at the joint. Next place your Guinea fowl breast side down on your chopping board. Cut straight down the centre of the back of the bird from head to tail. Working on one side at a time (my preference is to do the left side first), slowly and carefully starting at the head and working down the bird cut the meat away staying as close to the bone as possible and making sure that you remove as much of the meat as possible. When you get to the wings and legs cut through at the joint to enable you to continue working down the length of the carcass until you get to the bottom. Repeat the process on the other side. When you get to the point that the bird is only attached to the carcass by the backbone, using your finger to avoid tearing the skin run you finger between the backbone and flesh to remove the carcass. Next tunnel bone your wings, pulling the bone out at the end to turn your wing inside out. The reason you do this is so that you have no holes in the skin once you have finished deboning the Guinea fowl. Repeat the same process with the legs. Once the legs are inside out remove as much of the sinew as you can. Once you have completed this you will have a deboned Guinea fowl ready to stuff and roll. Note: Remember to use all the bones and trimmings to make stock which will form the base of your gravy. 5. Once you have deboned both of the birds you can prepare them for cooking. Split your prepared stuffing in two and shape into cylinders. Then place the stuffing in the centre of the birds where the carcass would have been. (Don’t worry if you have too much stuffing to go in the middle as you can shape it in to small balls and cook as separate stuffing to serve with it). 6. Next fold over the skin so that it overlaps slightly and then wrap the rolled guinea fowl with streaky bacon. 7. Next tie your joint with some cooking string to hold it together whilst cooking. The best knots to use are a slip knot followed by an overhand knot (aka a Butchers knot). Don’t worry if you find this too difficult just tie a knot that will hold the meat securely. 8. Place the meat in a lightly oiled roasting tray and cook at 180C Fan/ Gas mark 6 for 1hr 15mins -1hr 45 mins. To test that your birds are ready insert a meat thermometer into the centre of the joint, if it reads over 65C they will be cooked through. 9. Once cooked remove from the oven, wrap both joints in tin foil and leave to rest for 20 minutes before carving. 10. Serve with roast potatoes, seasonal vegetables and don’t forget the gravy. This entry was posted in christmas, fruit, game, main meal, nuts, pork, recipes, roast and tagged christmas, eats, foodblogger, foodie, foodphotography, foodstagram, healthyeating, recipes on December 6, 2015 by Antonia Cooks. Well it is that time of year and Christmas would not be Christmas without a mince pie. Mince pies do not last long in our house especially when all the boys are at home. I tend to vary how I make my mince pies over the course of Christmas sometimes using plain pastry (a combination of 2 parts flour to 1 part butter and a pinch of salt brought together with a little water) sometimes I make sweet pastry (by adding an egg and some sugar to the pastry mix). However, today I decided to make almond pastry which is lovely and crumbly and goes very nicely with the mincemeat. Nothing can really beat a homemade mince pie, particularly when it is served with a little cream or brandy butter (a combination of softened butter, icing sugar and a splash of brandy). If you have the time, do make the pastry by hand as it will make it far more crumbly and it won’t run the risk of being ‘overworked’! If you think you are going to be short of time over Christmas, you could always prepare a batch of mince pies in advance and freeze them – if you do this, don’t glaze them with egg and sugar before placing them in the freezer, do it just before you put them in the oven (make sure you take them out of the freezer at least an hour before cooking so that they can come up to room temperature beforehand. This entry was posted in baking, cake, christmas, preserves, pudding, recipes, tea time and tagged christmas, food, foodblogger, homecooking, instayum, recipes on December 20, 2012 by Antonia Cooks. If there was one vegetable that for me could sum up Christmas it would be the Brussels sprout. Spouts are a much unloved vegetable; however personally think that they are great. On Christmas day we eat them plain as there are so many other flavours going on – what with the gammon, goose, roast parsnips, roast potatoes, etc… However, sometimes it is nice to do them slightly differently. The recipe below mixes a variety of sweet, nutty and slightly salty flavours which work nicely with the sprouts. The honey in the recipe acts as a glaze for the vegetables giving everything a pleasant shine. This recipe could be eaten as a side dish to a grilled chicken breast, lamb chops or a piece of venison as the sweet flavours from the honey and cranberries would complement the gamey taste of the venison very well. Cook the Brussels sprouts in some salted boiling water for around 7 minutes, to test if they are cooked see if you can insert a knife easily into one of them, then drain. Be careful not to overcook because soggy sprouts are not pleasant! Whilst the Brussels sprouts are cooking, place the lardons and red onion in a hot frying pan and cook until the onions are soft. Add the chestnuts, cranberries, honey and butter, stir together. Once the butter and honey have melted add the Brussels sprouts and mix together. Serve. This entry was posted in christmas, main meal, quick & easy, recipes, side dish and tagged christmas, comfortfood, festivefood, foodie, instayum, recipes on December 14, 2012 by Antonia Cooks. This year I have actually got my act together and made my Christmas cake well in advance of Christmas. I am trying to be very diligent and feed the cake weekly with a local alcohol called Vin de Noix (Walnut Wine) so that the cake is beautifully moist when I eventually cut into it on Christmas Day. We in fact make the Vin de Noix each year in mid-June using a combination of green walnuts, eau de vie, red wine, sugar, orange and spices. The resulting drink is quite delicious and smells like Christmas pudding. I used it last year to soak the fruit in for my Christmas cake and then used it to feed the cake in the weeks leading up to Christmas. The resultant taste was superb. However, I appreciate that Vin de Noix is not something that everyone can readily lay their hands on, so I would advise you to use whatever you have to hand for example Sherry, Madeira, Brandy or Whisky. I have in fact made two Christmas cakes this year, one for my grandmother and one for me. The cakes are not the same as I used what I could find in the store cupboards of each house, so, as an example my grandmother’s cake was made using white sugar which meant her cake was a golden brown colour after cooking. By contrast I used dark brown sugar in my cake and so I have a cake that is a deep brown colour as you would expect of a rich fruit cake. 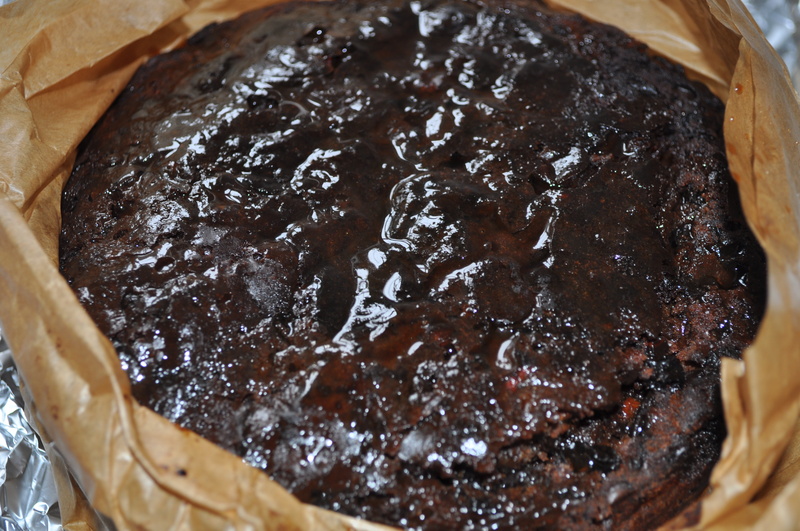 The one thing I ensured about both cakes was they were packed full of dried fruit, essential for any Christmas cake. So for now, both the cakes are wrapped up tightly in tin foil and have been stored away in some old air-tight sweet tins, keeping them fresh between their weekly feeds. They will remain this way until they are iced in the week before Christmas. (See icing the Christmas cake). 1. 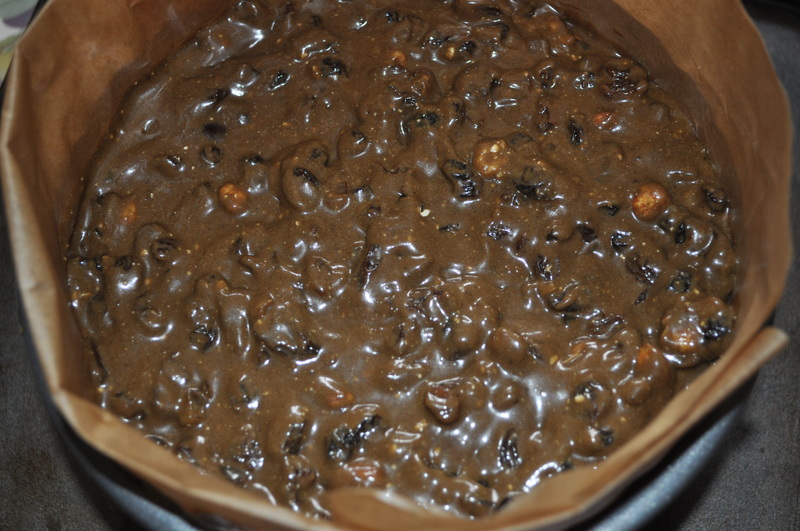 Place the dried fruit, raisins, sultanas, currants, glacé cherries, mixed peel and Vin de Noix in a bowl, cover with cling film and leave for as long as possible (12hrs minimum, the longer you leave it the better the cake will be). 2. When your fruit is ready make your cake batter. Cream the butter and sugar together in a bowl, then slowly add the eggs being careful that they don’t curdle (if in doubt add a little flour at this stage to stabilise your mixture). 4. Add the flour, spices, salt, zest and treacle to the mix and combine using a large metal spoon. 5. Finally add the nuts and the fruit to the batter and stir well making sure that the fruit is evenly distributed through the batter. Cutting out 4 circles the size of the tin, 2 of these will be for the bottom and the other two will be for the top of the cake. Cut a 1” cross in the centre of the two circles to be used for the top of the cake. 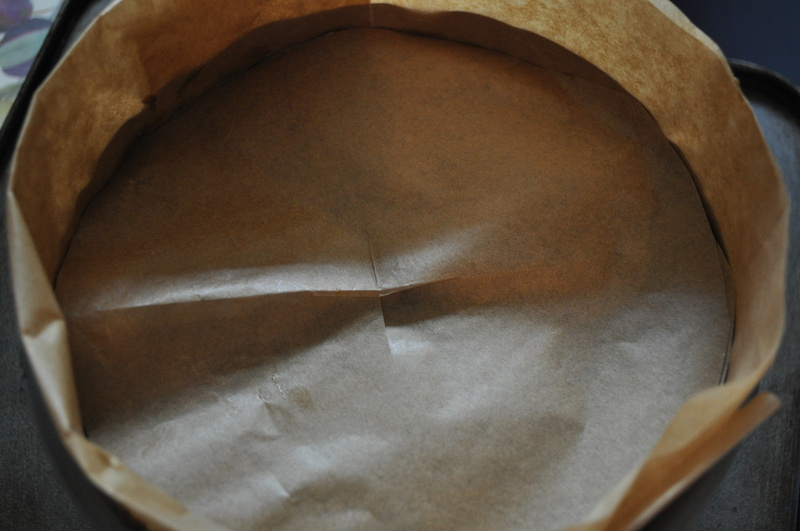 Cut a long piece of baking paper big enough to go around the outside of the tin, fold it in half lengthways. On one edge make a crease (roughly an 1”) then make cuts every inch up to the crease (this will allow the paper to fit far better into the tin). 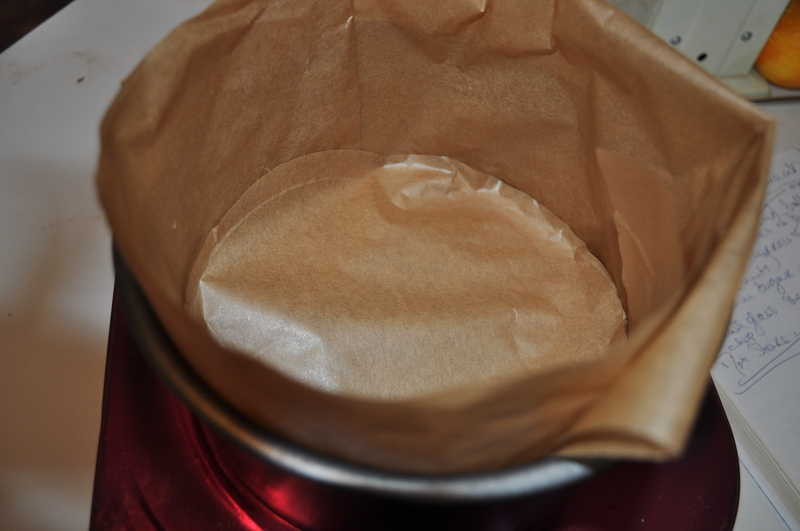 Place the long piece of baking paper in the tin first, so that the cuts in the paper lie smoothly on the bottom of the tin. Fill the cake tin with the batter, push it down gently, then place the two circles of the baking paper with the cross over the batter. Finally, take a large piece of brown parcel paper, fold it in half lengthways and wrap it around the outside of the tin, tying it in place with a piece of string. 7. Place the cake in the oven and cook at 150C fan for 3 -3 ½ hours (or until a skewer comes out clean). 8. 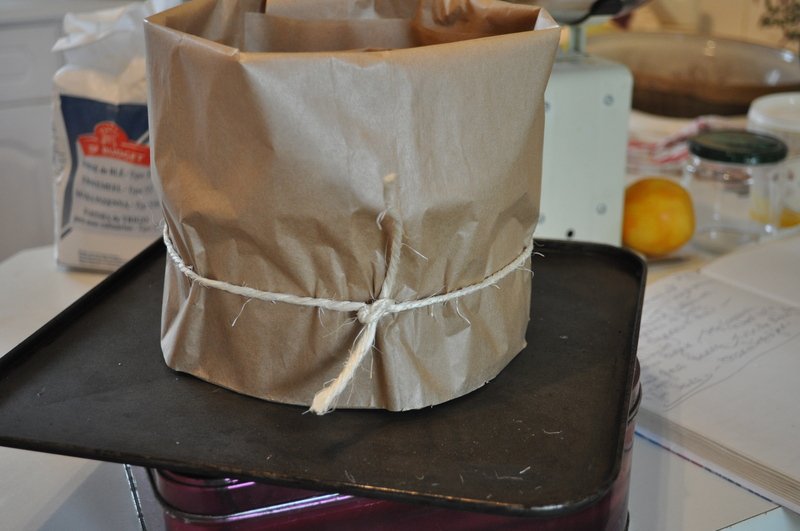 Remove the cake from the tin and leave to cool completely, before feeding with 1tbsp of Vin de Noix, then wrap tightly in tin foil and place in an airtight container. 9. Continue to feed the cake once a week with 1 tbsp of Vin de Noix up until it is iced. This entry was posted in baking, cake, christmas, drink, recipes, tea time and tagged cake, celebration, christmas, festivefood, foodie, instayum on November 1, 2012 by Antonia Cooks.